In early 2013, a stunning banner on Mexico’s streets and sub-way stations took everyone by surprise—a poster with 12 teaspoons of sugar against a bottle of cola, asking people in bold letters if they wish to consume that much sugar. The poster was part of a public interest campaign to tax sugar- sweetened beverages (SSBs), as per capita consumption of SSBs had jumped a whopping 60 per cent in 17 years. 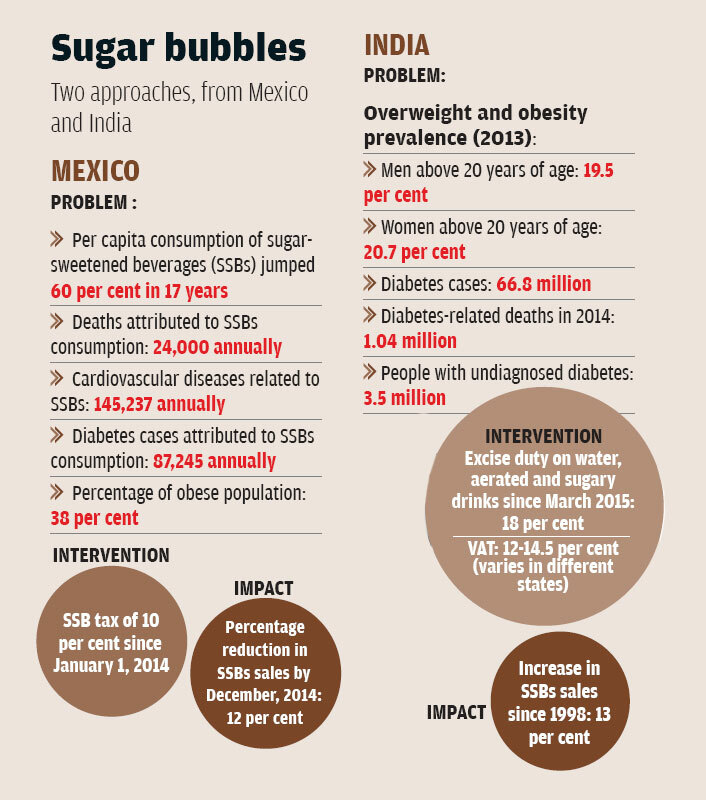 Mexicans were consuming an annual average of 163 litres of sugar-sweetened drinks per person. Not surprisingly, 38 per cent of Mexico’s population is obese. The top diseases in 2013 were cardiovascular and diabetes, leading to 145,237 and 87,245 deaths respectively. 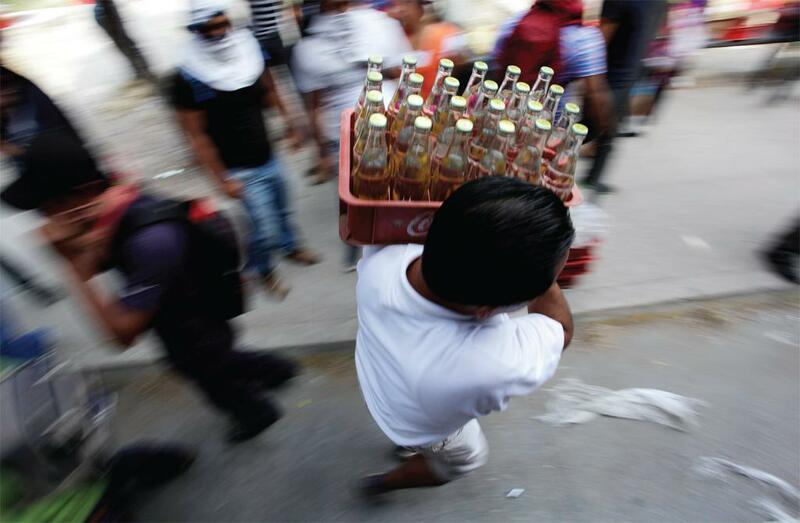 The Mexican government finally clamped down on the consumption of SSBs. A special excise tax of 10 per cent was levied on SSBs on January 1, 2014. SSB tax is an additional or special excise duty levied on the volume of sugar-sweetened drinks, over and above other basic taxes that are levied on goods. The hike in tax is usually given as an indicative name—soda tax or SSB tax—and is accompanied by a declaration or a public health message, even campaign components. The results of SSB tax have been positive so far. A recent brief by the Mexico health department says SSBs sales dropped by 12 per cent by December, 2014. Global studies indicate a consumption decline after the imposition of sugar taxes. A study by a European research firm, reveals that demand for soft drinks declined in France, Finland and Hungary between 2011 and 2013 after the introduction of SSB tax. The 2014 WHO’s Evidence on Nutrition Actions also reports a decline of SSB sales globally, though the rise in consumption comes from low and middle-income countries in Asia and Latin America. The SSB tax was a result of a sustained campaign by the Mexican government, backed strongly by local non-profits. “Beverage manufacturers fought back. The academia and ngos too responded. Now, more people are aware of the negative health effects of soda and SSBs,” says Simon Barquera, director, nutrition policy research, National Institute of Public Health, Mexico. The tax may not have completely solved a multi-factorial problem like obesity, but the results reveal there will be significant impact on public health, he adds. The campaign has co-benefits too. “Mexico faces acute scarcity of safe drinking water and many schools and households are not even linked to the basic supply chain,” says Barquera. The revenue from the SSB tax has been earmarked to provide drinking water in schools and installing drinking water fountains across the country. With demands now brewing to hike the tax to 20 per cent—as per WHO recommendations—Mexico has set an example. The concept of the SSB tax isn’t new. Norway and Samoa have added small, but extra quantum of tax on sugary drinks and confectionary items. Finland introduced a tax on sugary drinks in 2011. France introduced a sugar beverage tax in 2012 and further hiked it in 2013 to include energy drinks such as Red Bull. Hungary and Berkeley, usa, too tax sugary food and beverages. Policy paralysis 2.0 While countries across the world are using the precautionary principle to tax sugary beverages, India still is slowly waking up to the health hazards of sugar drinks. The 2013 Global Burden of Disease report states that India is among the top 10 countries in the world battling obesity and the country is also the ‘diabetes capital’ of the world (see ‘Sugar bubbles’). In its interim budget in 2014, the Union government levied a five per cent additional excise duty hike on aerated and sugary waters (apart from the standard 12 per cent duty). In this year’s budget, this additional excise was removed and a basic excise of 18 per cent (including a fresh hike of 0.5 per cent in both standard and basic excise) was introduced. The hike was on waters, mineral waters, aerated and sugary drinks. The current excise not only clubs packaged drinking water in its ambit, but is also levied on the mrp of the product, rather than the volume (as is in the case of Mexico). In addition, the tax doesn’t necessarily translate into a price hike on all available volumes of soft drink bottles, as is demonstrated in the case of tobacco, which the government is attempting to prohibit. Though Finance Minister Arun Jaitley said in his budget speech that the hike is for public and fiscal health, its positioning as a dedicated “soda tax” isn’t clear. Beverage companies did raise a brouhaha about increased costs, and then everything went back to normal. “If the government wants to prohibit consumption, the duty at both Centre and state levels should be more than 20 per cent at least,” says a member of the Customs Excise & Service Tax Appellate Tribunal. An excise department officer says the fact that packaged water is included in the excise duty indicates that the government isn’t looking to address sugary drink consumption issue. Experts say generating money through this tax can help the 103.8 million people who do not have access to safe drinking water. Meanwhile, cost of packaged drinking water remains high-`10-12 for a 500 ml bottle. “The term “health-related food duty” is recommended as it conveys the health purpose of the policy and the notion of responsibility underpinning the payment on duties on goods that contribute to social harms,” states a report of the UK’s National Heart Forum. When it comes to public health taxation, there must be a multi-pronged approach, and a duty hike must be accompanied by awareness programmes and public health advertising, believes Monica Arora, director, Public Health Foundation of India (phfi). “When you put a label, you send a message to the public that it is bad for health. For instance, the ban on gutkha was accompanied by several public health messages,” she says. A 2014 study by Stanford University and phfi emphasised that a 20 per cent SSB tax in India (over and above the existing excise duty) is likely to prevent 11.2 million new cases of overweight and obesity and 0.4 million cases of type 2 diabetes between 2014-2023. The Union government needs to swallow some sugar-coated medicine if it is serious about protecting people’s health.